Wash the rice until the water runs clear then drain and place in a saucepan. Cover with water - you should have 10% more water than the weight of the rice. Cover with a lid and bring to the boil. Lower the heat and leave to cook for 12 minutes. Remove from the heat and leave to rest for 10 minutes. Alternatively, cook the rice in a rice cooker. Spread the rice out on to a baking tray or roasting dish. Mix the rice vinegar, sugar and salt together. Sprinkle the dressing on to the rice and stir gently. Allow the rice to cool to room temperature. Cut the nori leaves in 2. Cut half of the salmon into 5mm thick batons. Cut the avocado and the cucumber into strips. 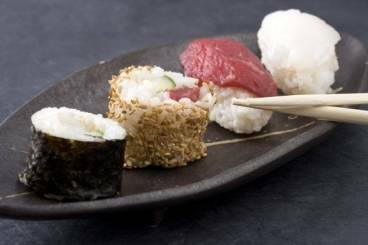 Place a nori on a sushi mat and spread rice over 3/4 over the sheet. The layer of rice should be about 5mm thick and should only be spread to the edge of three sides of the sheet. Place some salmon, cucumber and avocado at one edge. Season with a little pickled ginger, wasabi sauce or any other condiment you prefer. Firmly roll the sushi mat up to make your makis. Brush a little water on to the bare edge of nori and seal the roll, allowing it to rest on this last edge for a few minutes. Cut each roll in to 6 using a sharp knife. Be very careful not to tear the nori when cutting the makis - clean the knife if necessary. Cut the rest of the salmon in to 1/2cm thick slices about 4cm long and 2cm wide. Mix a little water and rice vinegar together. Place a drop or two of this liquid on to your hands and rub together to moisten. Take a small handful of rice, about the size of a ping pong ball and roll in to a quenelle shape. Season a slice of salmon with wasabi then roll around the rice. Serve with soy sauce, pickled ginger and wasabi.